For the first time in history, a Canadian has won the Nobel prize for literature! 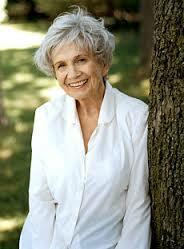 Her name is Alice Munro. She is one of the most respected writers in the world. She is an 82 year author, and she has published 14 books in total. She has announced her retirement, and has said that her recent book “Dear Life” will be her last. Alice Munro won the Nobel prize on Thursday October 10th, 2013, for her tales on the struggles, loves and tragedies of women in small-town Canada. She wants all Canadian writers to inhabit the style of short story writing, and carry on with it.